If you have kids and pets, you’ll need more open space to allow for play. If you intend to use your garden for lounging and relaxing, a seating area or reading nook is more appropriate. Deciding what you want to do in your garden will help you to plan for your needs. 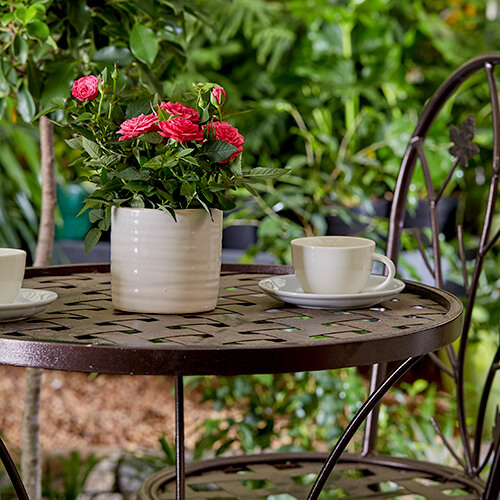 Even the smallest garden should have somewhere cosy and tranquil to sit – a respite from the daily grind. Browse your closest Stodels garden centre for a large range of table and chairs, or upcycle wood to create a simple DIY garden bench. If you want to lay down paving or fixed seating, plan where this will go. Opt for low-maintenance and inexpensive mulch or gravel to create pathways connecting smaller areas. Mask ugly walls and create a safe nook with a lush, green border. This added height will also give the impression of spaciousness and add vertical interest. To create a border, plant water-wise climbers, such as bougainvilleas and clematis hybrids, or hedges, such as viburnum and buxus, against boundary walls and fences. Place plants about 1m apart and at least 0.5m from the wall so that they have space to root and grow. Garden beds should ideally have a soil depth of 20-30cm to allow plants to root. Ensure you leave space (at least 60cm) for access between beds. Create boundaries around your garden beds with pebbles, rocks, paving or grassy edging plants, such as acorus, carex and liriope. Trees and shrubs: These form the backbone of any small garden. Choose small trees that are proportional to your space with non-invasive root systems, such as lavender, cheesewood and pom-pom trees. Small shrubs such as the Mickey Mouse bush, wild pomegranate and Mexican orange blossom are also good options for smaller gardens. Perennials: Perennials persist for many growing seasons and play an important role in making your garden beautiful throughout the year. Annuals: These plants only last for one growing season, but are perfect if you want to experiment with or change your garden’s colour theme from year to year. Violas, pansies, torenias, alyssum and primulas are all beautiful options. Dwarf annuals include pixie, impatiens and surfinia and nicotiana ‘Tinkerbell’. Herbs and vegetables: Grow your own edible plants for homegrown produce all year around. Herbs and vegetables can be planted either in pots or mixed in with the other plants in the garden. In order to create the illusion of space, select only a few varieties of plants and repeat them. Bear in mind that warm red and orange colours will make a garden look smaller, while cooler pink, mauve, white, and blue plants, and those with soft grey foliage, will give the impression of spaciousness. Don’t cram too many crops into your garden, as this will result in overcrowding and poor air circulation, which may lead to pests and disease. Note that lawns are entirely optional and generally not a good idea to include in small gardens as, apart from requiring maintenance, will emphasise the lack of space.